Ryan Farquhar, at twenty-four years old, is one of the most exciting prospects on the Road Racing scene. 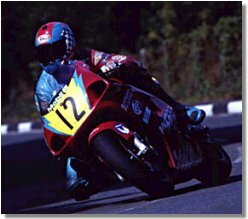 He won the 2000 Manx Grand Prix with consummate ease, and had several excellent results at other meetings throughout the season. This year he is back more determined than ever with more machinery aiming for glory at the TT. We spoke to Ryan from his home in Dungannon, Northern Ireland. 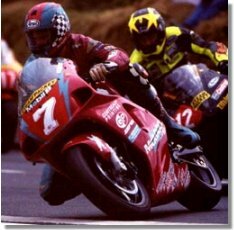 So Ryan, first of all you had an excellent season in 2000 achieving your main goal by winning the Senior Manx Grand Prix. You also had several other good results last year so you must be happy with how things went? Aye that's right. 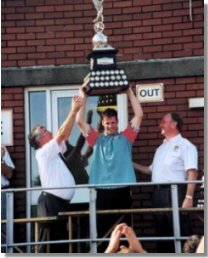 At the start of the year the plan was to win the Manx, the Junior Race as well, but it didn't happen although I was very happy to win the Senior. The North West was a bit of a disaster because the 600 blew up on the second lap of practice. The Superbikes were running with the 600's then and I couldn't get back to the pits. Then on the Thursday, the session was called off because of the fog, so when the race came, I hadn't done one lap of practice on the big bike. 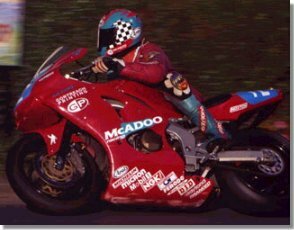 The Southern was better and I managed four fourths there, and I got two seconds at Skerries and Dundrod. At Skerries Archibald beat me to line the line each time, but it was really close. At the 'Manx' you dominated the Senior race. Tell me about it; was it as easy as it looked? (Laughs) Well from the flag I just went as quick as I could because I wanted to build up a gap at the start and everything went to plan. I thought it was going to be tighter than it was; I couldn't believe how easy it was really but I really enjoyed it like. I would have liked to have pushed harder to see how fast I could have lapped. I did over 117mph from a standing start, but I reckon on a flying lap if I had been trying hard I could have added two or three miles an hour to that. You broke down whilst leading the Junior race at the Manx. You seemed to by flying, do you think you could have won that one as well? Aye, I think I could have. From the start to about Ballacraine, I was held up a few times but then from there to Ginger Hall, I reckon I would have made a lot of ground. I reckon if someone had a clock on us there, I could have been getting on to about twenty seconds ahead. It was probably the fastest I've ever ridden that section, because I knew it was going to be a tight race. I think I would have like. I was six seconds ahead at Glen Helen after getting held up and when I started getting a good run I think we would have pulled more. This year, you move up to the TT of course. You must be looking forward to the prospect? I can't wait. We've got a new R1 and Philip (McCallen) is going to help me with what should be a competitive bike. I'm training really hard so I should be in good shape, and I'm going to give it my best shot. Tell me about your current regime; do you always train this hard? No, I've never trained this hard before. I was talking to Woosley Coulter and he was telling me how hard he's training and then when we got the bike of Philip, he was telling me how hard he used to train and how fit you have to be. He reckons that was what was wrong with Joey there for a few years with the bigger bikes because he wasn't fit. But last winter like, he reckons the amount of training Joey did and how fit he was just made the difference at the TT. So I've just bought a new Mountain Bike, and I'm doing ten miles a day through the week, and then at the weekend I'm doing about thirty miles. I'm doing some weights and stuff at the house, so as much as I can. Jogging would be good but I can't do it because I broke my ankle in '94 and I have a pin in it, so running doesn't really agree with it. Your sponsor, Winston McAdoo, has purchased Philip McCallen's R1 Yamaha for you to ride in 2001. There has been a lot written about the bike in the past, and it is allegedly very quick indeed. Tell us what you know about the machine so far? What Philip said to me was that he fell out with Honda, and then Motorcycle City told him they would build a bike for the TT to beat Honda. There was no expense spared when they built the bike, including full World Superbike spec forks, quick release wheels, fancy brakes and there's two engines. He reckons it will be the quickest bike at the Isle of Man but we'll have to wait and see. When he rode the bike, he was more or less riding it with one arm because he had a busted shoulder and he still went well at the North West on it that year. And you say Philip is going to help you with the machine set up? Yeah, he's really keen. He's always on to Winston (McAdoo) telling him to make sure I keep training. He said that he will help me but I don't quite know what arrangements have been made. Will Bob Jackson, who has been your mentor in recent years, still be involved with the team? No not really. He will be at the TT and that and if I want anything I can ask him, but he's not going to be part of McAdoo Racing. He's a bit fed up to be honest with all the travel and that to Ireland. It's nothing personal with me, but there has been a couple of things throughout the year, and he's had enough. How much of a help has Bob been to your career in the last few years? Well I had never ridden a four stroke before and he was able to tell me what way to do this or do that. The first year I rode for Winston I was riding a 125 and a 250, a 600 and 750, so I would be getting off the 125 on to the big bike and then back onto the smaller bike and it was a waste of time, because we were getting nowhere. Then Bob said if I wanted to get anywhere with the big bikes, I would have to stop the wee bikes, so we scraped the 125 and 250 classes and concentrated on the big ones. You had some good performances in Ireland and at the Southern 100 as well last year. Are you planning to take in the same meetings as you did last year in 2001? Well I'll be doing the same Road Races but I want to do all the Regal and Lambert and Butler Short Circuit rounds as well. Archibald, Britton and these guys are riding every weekend where I was having four or five weeks break, and the short circuits were keeping them sharp. Winston was never keen for me doing the short circuits because he's not interested in them, but he agrees with me now that I have to do them to keep myself sharp and bike fit. Do you see yourself continuing riding on the roads or are you considering moving to ride the Short Circuits in the UK at any stage? In '96 I tried to go Supercup racing and I did a few races but the bike wasn't competitive and nobody wanted to spend the money. If anything ever happened to Road Racing at home and they banned it, I would probably look to go Short Circuit racing in England, but it would be hard work with all the travelling and that. As we both know, Road Racing as a sport has been the subject of much debate over recent months after the tragedies last year. What are your thoughts concerning the sports future? The way I look at it is if there's riders there to ride and there's clubs there to run the races and there's sponsors, I think there will always be Road Racing. I suppose the DOE could stop us closing the road but I can't see them doing it, because Road Racing is probably the biggest sport in Ireland. But you never know, if we have another year like last year you never know what might happen, but if we get a few years were there's no accidents you wouldn't hear another word about it. In the last year the riders that have been killed have all been from the front end of the field, and although it might not necessarily be right, it seems to make a bigger impact with the press and public? That's right. It's the same right across the board. Like in car racing for instance, if Michael Schumacher was killed it would be in every single newspaper, but if somebody was killed in a car race at say Jurby, you wouldn't hear a word about it. I don't want to see anything happen to Road Racing, that's for sure. Every rider knows the risks and thinks it will never happen, and you just carry on. And you have told me about the R1, but what other machinery will you have for 2001? I have two 600 Kawasaki's, a Regal spec one and a tuned bike, from last year with Kawasaki UK support and the big ZXR for a spare but hopefully we'll never need to use it. I'm meant to be riding Dean Cooper's R1 at the North West, TT and the Ulster in the Production Race's but there may be a bit of a doubt at the TT because of a few things. 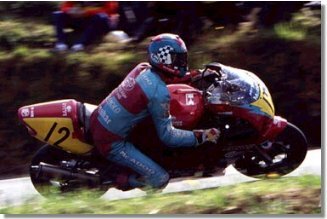 You made your name riding two strokes in Ireland. Will we ever see you back riding a 125 or 250? I don't think you'll ever see me back on a 125 because I'm too big for one. As for a 250, well I started out on them, but the problem with a 250 is the cost to buy the bike and the class itself is dying. If you take the TT for instance, there isn't that many starters and they have cut the prize money. The class is finished. I think in four or five years, there won't even be 125 races on the roads. The manufacturers aren't interested because the bikes they sell in the shops aren't 250 racing bikes, they're four stroke road bikes. I mean you could take an R1 and for about six or seven grand you have got a rocket ship, but with a 250 you have to spend thirteen grand, then you have to tune it and there is no guarantee it is going to run well. Finally Ryan can you tell me what are your main aims for the 2001 season are? I want to win Road Race's. I've had quite a few second places where I have led right until the last lap and something's happened. I want to be first or second every weekend like Archibald and Britton are. What are you looking for at the TT? I think you will be looking for top ten's? (Laughs) Well I can't really say. Put it this way, I would be fairly disappointed if I was outside the top ten. Well Ryan it has been lovely talking to you, and I wish you all the best for 2001. Thanks and anytime you want anything else just give me a shout.